The inventor of CyberTran, Dr. John Dearien, knew that effective public transit is the future of transportation. A senior engineer with the United States Department of Energy (DOE) in Idaho, he had seen first-hand the problems and frustrations associated with typical transit systems. Armed with engineering knowledge, common sense, and the support of both government and the private sector, he set out to design a new transit system from the ground up. His goal was to change the public’s experience with transit by cutting costs and improving convenience, safety, and the overall passenger experience. 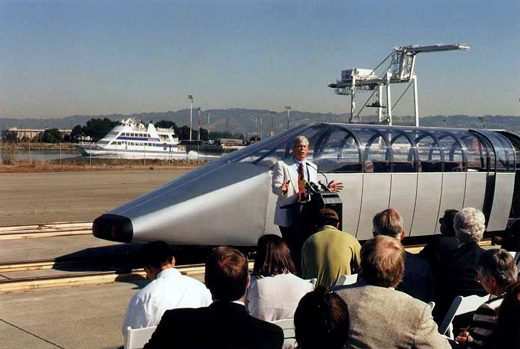 Collaborating with scientists and engineers at the National Engineering Laboratory in Idaho, Dr. Dearien built the first prototype vehicle for testing. He called his new system “CyberTran,” short for “Cybernetic Transportation.” The first of several test series focused on the basic system, and later tests became more specific to features such as the proposed guideways and computer controls. After several years of development in Idaho, CyberTran moved to California, where it had closer access to markets that desperately need new solutions to old transit problems. Today, development continues at CyberTran International’s current facility at the UC Berkeley Richmond Field Station in Richmond, CA.